Simpler, faster, and still uniquely yours! New York always has a special spot in our hearts. We love New York so much that we got engaged in Central Park and can't wait for another opportunity to visit the Big Apple again! I want something with clean and subtle designs for a suite that carries its name. The same design that can be easily transformed from modern and sleek to romantic. Keep your design minimal with black and white digital print. Make them romantic with letterpress on handmade paper. Or go all out dramatic and glamorous with foil printing! I'm proud to call Los Angeles my home for the last 11 years and you can't bring up Los Angeles without mentioning the allure of Hollywood or the luxury of Beverly Hills! That's why I created this suite that fully embraces the glamorous side of Los Angeles with dramatic black suites, a cloud of floral watercolor, and a dash of rose gold for good measure. Los Angeles is a city full of stars, but don't forget it's also home to NASA's JPL located in La Canada. Nothing complements this suite more perfectly than navy envelopes with space-themed vintage stamps! You can't be a Southern California wedding vendor without professing how much you love Santa Barbara! From the charming Spanish style city buildings, the beautiful scenery of its surrounding, and it's magical golden hour! Here's a romantic suite with complex floral illustrations and matching floral liners to compliment this charming city! 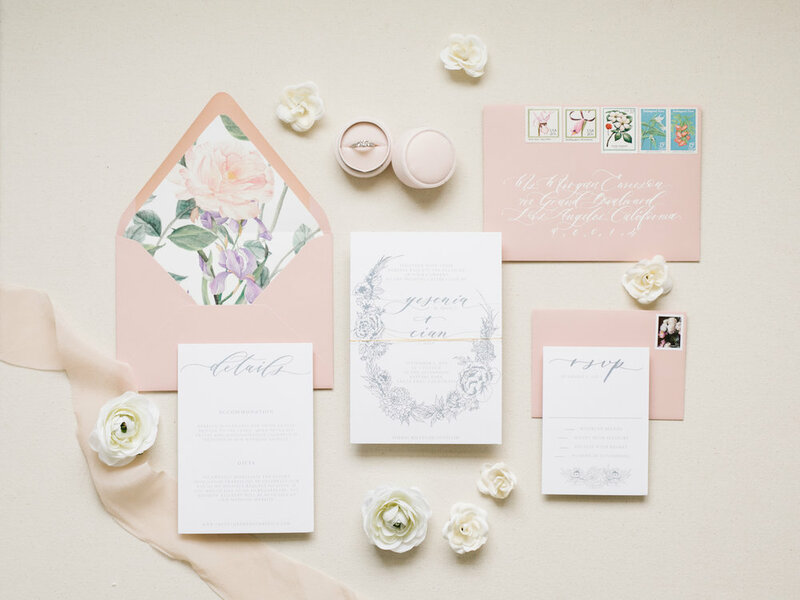 Make them even more romantic with handmade paper or add a pinch of luxury with foil press printing. Because after all the love and heart we pour into each suite, it's the finishing touches with exquisite attention to detail that separate your suite from all others! And I got you covered! From vellum sleeve, silk ribbon, matte or gold thread, to bespoke botanical wax seals (designed by yours truly) and vintage stamps. I'm all about those little details that make your suite like nothing your guests have ever seen before. It's no secret that I love pouring my heart and soul into each custom suite that I get my hands on. That being said, I understand that having a custom suite for your wedding is not always available due to budget or time constraints. I realize everybody doesn't have the patience to wait for a week while we're working on your estimates. But don't worry... Semi-custom suites are the perfect solution for all of the above! We are able to do this by using instant pricing, reducing the design time-frame significantly, and streamlining the printing method. We're hoping we can speed up the time needed to work on your invitation suite and make it within your budget. Of course, semi-custom does not mean they were created with half the love. All these designs are something near and dear to my heart! All watercolor liners and illustrations are still hand-painted and hand-drawn by me. Your calligraphy will still be done by hand, which means no two pieces of calligraphy will be the same. These are either something I wish I had when I got married, a personal favorite from a previous commission, or extremely popular options where variations of the design has been requested multiple times. Please check out our FAQ for additional information!